Both Sri Yantra #17 and #18 are the last pair open for public eye and for sale, and I have to underline the fact that in timeline they are closer than others to the time when the algorithm was just discovered (5 January 1994) but it took several months more before I really could enjoy a process of creating my own collection. 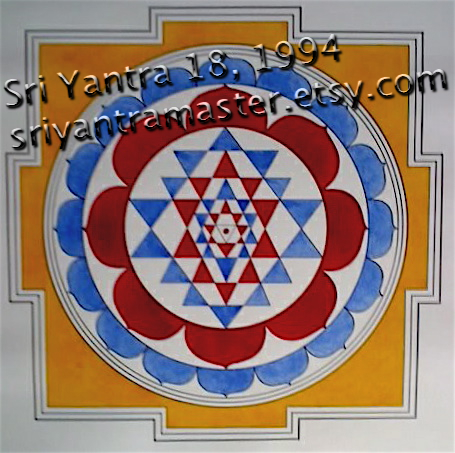 The basic colours of Sri Yantra #18 are red, blue, and yellow. Mekhala and Bhupura (mandala and square of defence) have three black lines of different width, increasing in inside out direction. I cannot help myself to say something about cult of simplicity in eastern countries widely spread among educated people in the past. I know that I can sit at my favourite desk and make up any kind of complexity (if you have seen more difficult star polygons you would understand what I’m talking about), but these two stars ARE closer to the first experience and greatest joy of discovery of the algorithm. It was enlightenment. I was speechless three days, I am still happy 15 years after that, I am just happy like a person who can see the world by the same eyes as a person three millenniums ago in another point of globe. No boundaries in time and space. The idea of Sri Chakra was a source for many people during long time, and these two stars #17 and #18 were the most powerful source for the whole collection and for the entire life of author. Y’know, 15 years have passed, and I have a reason to think about their beauty to the end of the days. The full story of glory and coolness of discovery of the ancient mathematical algorithm, its perfection in two variations (easy 6-points of touch and more complex 10-points of touch) of Sri Yantra and NINE, NINE/!!!!!! 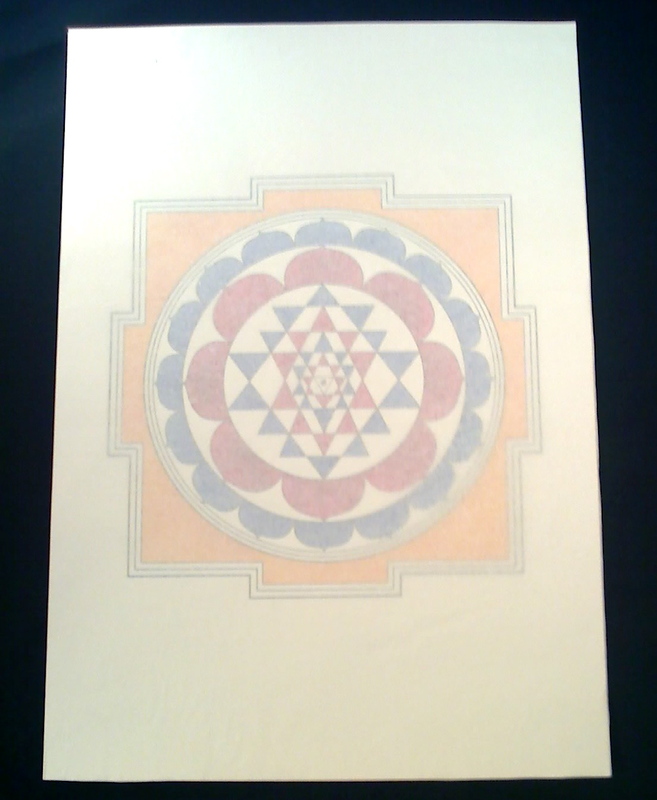 !/ variations of more difficult star polygons, Sri Sarvabhava Yantra (part of them) can be seen here, I hope. 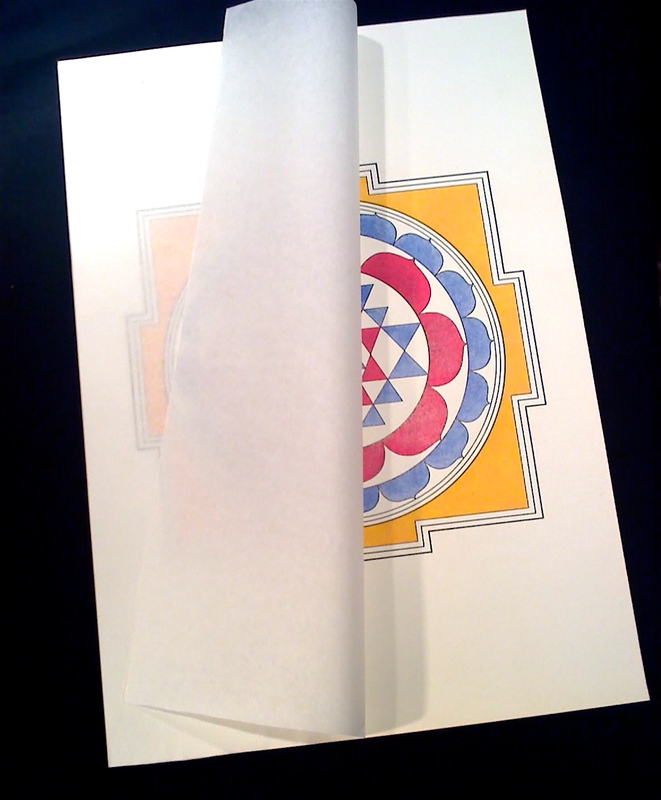 Sri Yantra #17 and #18 are the last pair open for public eye and for sale, and I have to underline the fact that in timeline they are closer than others to event when the algorithm was just discovered (5 January 1994) but it took several months more before I really could enjoy a process of creation my own collection. 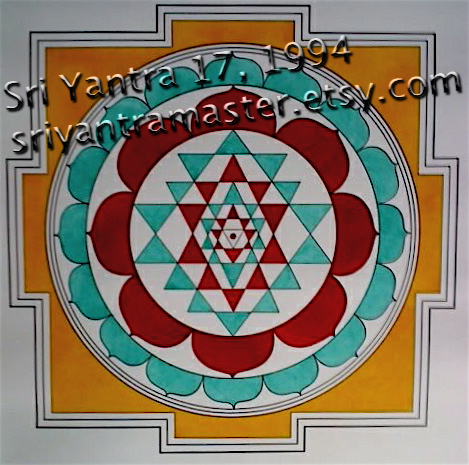 The basic colours of Sri Yantra #17 are red, green, and yellow. Mekhala and Bhupura (mandala and square of defence) has three black lines of different width, increasing in inside out direction. Frankly I have said almost all I had to say to levitate our conversation long enough. If you liked anything don’t hesitate to contact me any time online. The whole story of glory of discovery of the ancient mathematical algorithm, its perfection in two variations (easy 6-points of touch and more complex 10-points of touch) of Sri Yantra and NINE /!!!!!! 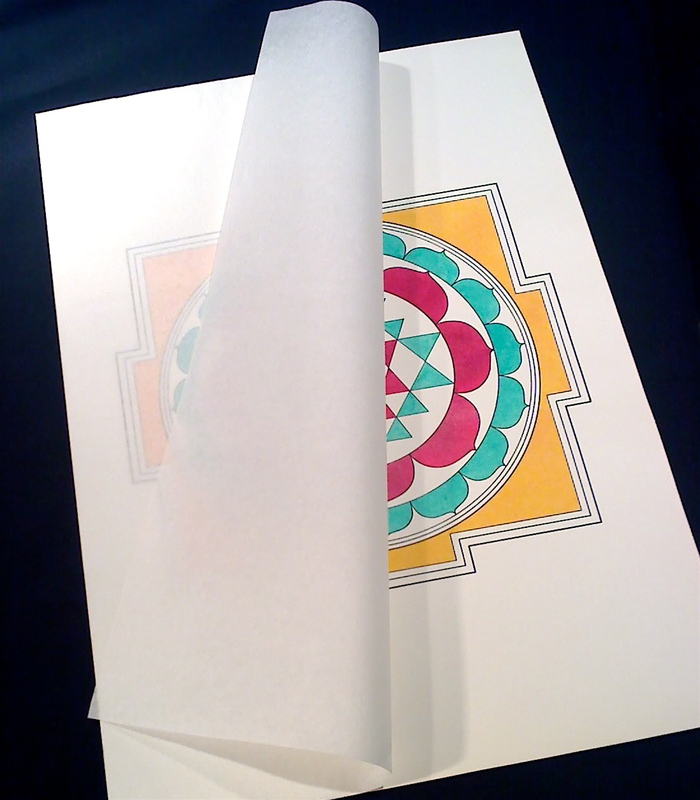 !/ variations of more difficult star polygons, Sri Sarvabhava Yantra (part of them) can be seen here soon, I guess.